When a trio of Israeli journalists were engaged in the late 1970s in writing a biography of Meyer Lansky, their prime source of material was a former top syndicate mobster and longtime intimate of Lansky, Bugsy Siegel, Lucky Luciano and Frank Costello. 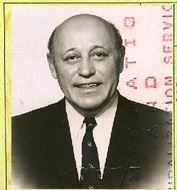 Joseph "Doc" Stacher, who emigrated to Israel in 1965, revealed considerable information about organized crime in America, almost as much as the better-publicized informers. But, unlike the stool pigeons, Stacher wasn't tattling. Said the Lansky biographers: "He was so proud of Meyer that he felt we should know the truth about his old friend's exploits." Stacher had reason to be grateful to Lansky, who made him a millionaire several times over, and Stacher was typical of many young gangsters—Jewish and Italian—who remained loyal to Lansky all their lives. Brought to Newark, New Jersey at the age of 10, Stacher quickly moved from juvenile thief to important member of the Bug and Meyer gang, headed by Lansky and Bugsy Siegel. In the 1920s he was running truckloads of bootleg liquor with the gang as well as aiding emerging New Jersey syndicate leader Longy Zwillman run many of his gambling enterprises. In 1931 Stacher was the chief organizer, on Lansky's orders, of a meeting of all the top New York–area Jewish mobsters at the Franconia Hotel. At the conference, it was decided that the "Jewish Mafia" would merge with the Italian Mafia into a new national crime syndicate—what eventually became organized crime in America. Lansky made Stacher his man in Las Vegas, representing the mob's interest there, especially as a payoff man. He also operated as the official bribe paymaster to Cuban dictator Fulgencio Batista, who "allowed" the syndicate to build and operate lavish casinos on the island. It was not until the 1960s that the U.S. government finally nailed Stacher for any meaningful charge, that of income tax evasion. Facing a five-year rap, Stacher could not be deported to his native Poland which would not accept him. Instead he made a settlement with Internal Revenue and immigrated to Israel, a right he had as a Jew under that country's "Law of Return." Stacher worried if he would get Israeli citizenship and reputedly had his longtime close friend, singer Frank Sinatra, intervene through friends for an Orthodox member of parliament to come to his assistance. The M.P. owed Sinatra because the singer had contributed heavily to the American fund-raising done for religious educational institutes in Israel. To further aid the M.P. 's cause Stacher donated $100,000 for an Orthodox charity. Instead, the M.P. used the money to build a kosher hotel in Jerusalem. Outraged at being ripped off, Stacher sued in a court case that drew headlines and laughs throughout the country. Israelis were amused that such a giant figure in American crime could be so taken by a meek-looking rabbi. Stacher was regularly referred to in the Israeli press as one of the leaders of the "Kosher Nostra," as distinguished from the Cosa Nostra. In the end Stacher got his money back. After Stacher demonstrated to other Jewish mobsters that they could find a haven in Israel, scores followed his example. Lansky himself tried to immigrate in 1971, but public uproar as well as heavy pressure on the government by American officials made him too notorious and he was kicked out of the country. When Stacher died of cancer in 1977, Lansky, back in the United States, sent an enormous bunch of red roses, the inscription on the ribbon reading: "To Doc from Meyer." Stacher's funeral was rather impressive by Israeli standards but was small potatoes compared to the gangland send-off he would have gotten in the States.